Self-harm in adolescents is an increasingly recognized problem, and there is growing awareness of the important role schools and health services can play in detecting and supporting those at risk. 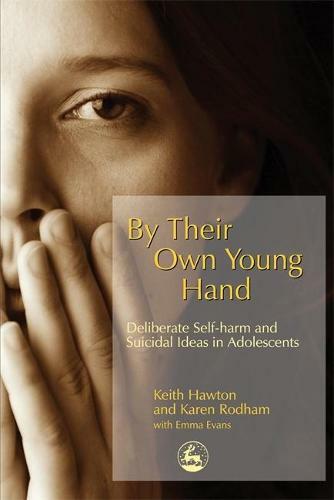 By Their Own Young Hand explores the findings of the first large-scale survey of deliberate self-harm and suicidal thinking in adolescents in the UK, and draws out the implications for prevention strategies and mental health promotion. Six thousand young people were asked about their experiences of self-harm, the coping methods they use, and their attitudes to the help and support available. The authors identify the risk and protective factors for self-harm, exploring why some adolescents with suicidal thoughts go on to harm themselves while others do not, what motivates some young people to seek help, and whether distressed teenagers feel they receive the support they need. By Their Own Young Hand offers practical advice on how schools can detect young people at risk, cope with the aftermath of self-harm or attempted suicide, and develop training programmes for teachers. It also examines the roles of self-help, telephone helplines, email counselling, and walk-in crisis centres. Packed with adolescents' own personal accounts and perspectives, this accessible overview will be essential reading for teachers, social workers and mental health professionals.